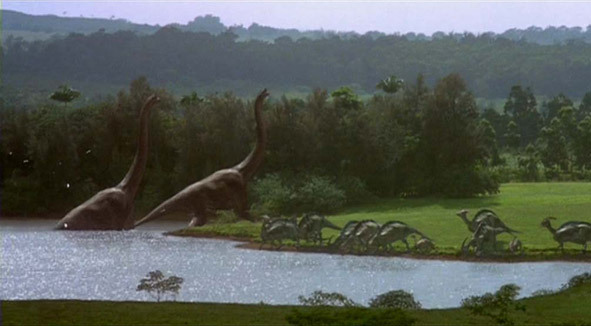 In Jurassic Park, after Hammond says 'Welcome To Jurassic Park' we not only see the Brachiosaurus herd, we also see a Parasaurolophus herd along with them. Yet, we never see them as part of the tour. Why is that? And what happened to them? Rexy eating many of them is a given. But we never know what happened to the entire population as a whole. Also, in JW, we see them via the Gyrosphere valley. Are they related to those in JP or are they new versions? The Masrani site says they are new versions, but they look nothing like the ones on the site. I find this so odd. At least with the Sorna population, we know that it's still doing good. But we know nothing about the Nublar population. 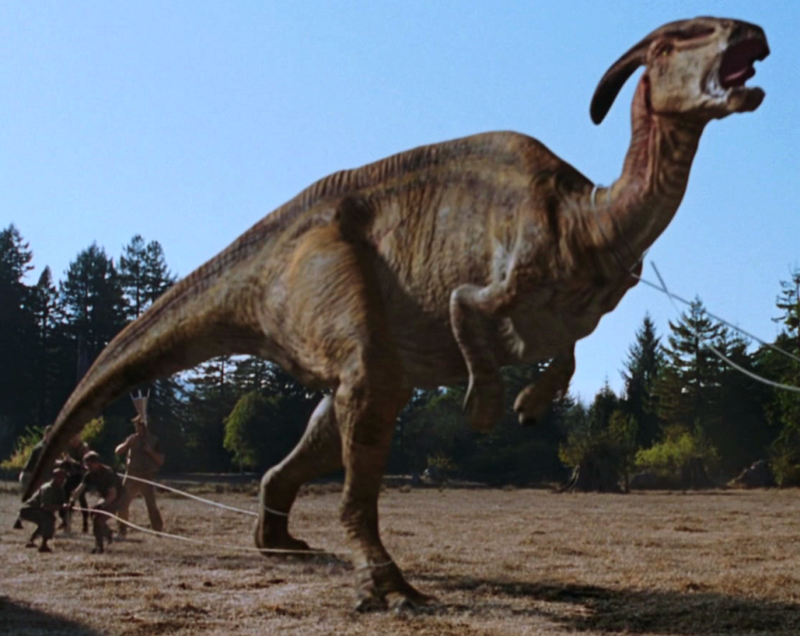 I have a theory (more than all a "Head Canon") about the population of Parasaurolophus on the island especially in relation to Jurassic World and also related to the species that were originally on the island during the existence of Jurassic Park. Regarding the Parasaurs, possibly, the park has divided in different places the males and females to the Parasaurs of the original populations that have lived in the island since the abandonment of JP for its reproduction through parternogenesis. My affirmation to this is that in the park they had three attractions that exhibited the animals (Gyrosphere, Cretaceus Cruise and Gallimimus Valley) and as we saw in the valley of the Gyrospheres, the design and also peculiar territorial behavior of this animal showed to be of the classic JP males (as seen in TLW), so possibly the female populations were isolated in other attractions to prevent the uncontrolled reproduction of the dinosaur. 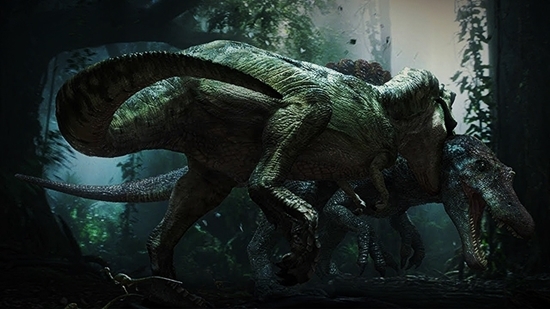 (I like to believe that every time there was a time to reproduce and that the young animals seen in the "Gentle Giants" are from those couples) And possibly during the "extraction of assets" from 2004 from Isla Sorna to Isla Nublar, For the new park, some specimens have been brought to increase the population on the island. (about the versions or the illustrations of the page, the truth that for me only are generic images of that species to demonstrate that it exists in the park, but they are not as they are seen in the island). About the relationship of this theory with other animals of the island is that I have noticed certain differences between the species on the island and its original variants with possible new versions or possible sexual dimorphism, an example of this (especially in new versions) are the Stegosaurus; it can be noticed that those exhibited in the river are more similar to the original TLW / JP3 versions than those seen in the valley of the Gyrospheres. To which comes a possible isolation of genres and versions as could happen with the Parasaurolophus. Another curious example are the specimens of Ankylosaurus in the restricted area, as we see from model are similar to the species of JP3, but coloration are more clear, possible sexual dimorphism and in the park male and female are exhibited, and have isolated the females temporarily to avoid uncontrolled reproduction; also, doing analysis of the Triceratops, every time I see them they are more assimilated to the coloration (without alteration of ground bath) of the original JP animatronic, to which it could be that the females are also isolated in the valley and that the males isolate themselves further north in that attraction called "Triceratops Territory". I clarify that it is only a theory nothing more. 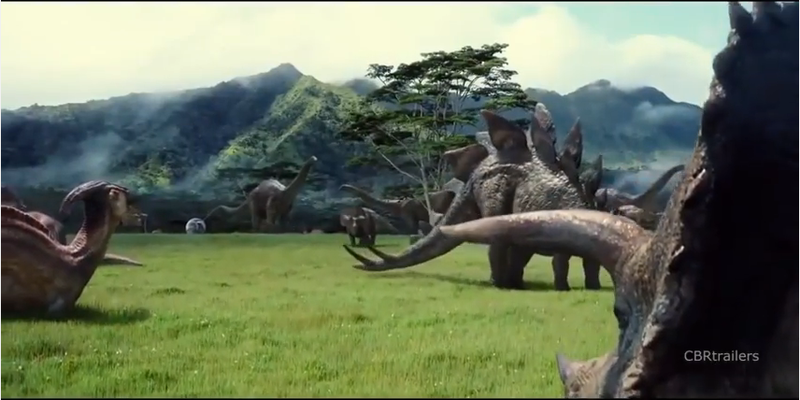 The Parasaurolphus from JW appear to be of the same stock as InGen's original clones. 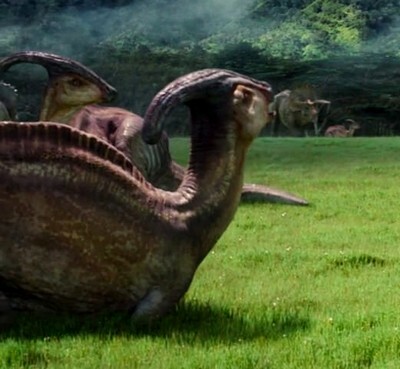 Would that mean that these Parasaurolophus are direct decendants of the ones from the original JP? Also, would that make it possible that at least one or two of the originals could still be alive on Nublar? Recall that if it is a possibility that if they are the descendants of the original Parasaurs exhibited in Jurassic Park if we take into account the freedom of reproduction that was maintained for 11 years in Isla Nublar, some male had to appear after the first parterogenesis reproductions of these animals, unless it is clear that the generation of females on the island has not survived (which I doubt due to the survival of carnivores such as Tyrannosaurus, which shows that they did not have to face a more dangerous herbivore to eat like Trikes or Stegos, and I doubt that the Gallimimus are their main source of food), although if, as you claim, it is possible that when they made the inventory of species between 2003 and 2004 on the island, there was a low population of animals and they supplemented it by extracting a few Parasaurs from the Isla Sorna, so both possibilities are totally plausible for the existence of this animal in the park. Subject: Re: The Parasaurolophus in Jurassic Park and Jurassic World.